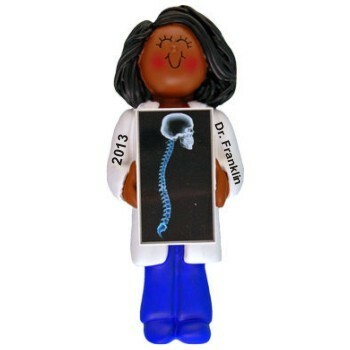 The African American female chiropractor personalized Christmas ornament is a fabulous way to say thanks to the person who keeps you feeling great or to honor the young lady who has recently graduated from a chiropractic college. It's one of many African American ornaments featured at Russell Rhodes to recognize achievement, celebrates weddings and babies, encourage participation in music or sports and much more. The female chiropractor personalized ornament arrives in our custom velvet bag that is great for gift giving and ornament storage.